The earliest known historical clue to what might be a primitive nautical chart is in a medieval manuscript of c.1200, the Liber de existencia riveriarum et forma maris nostri mediterranei, which describes the Mediterranean Sea. The body of the manuscript consists of an account of the Mediterranean and Black seas and the Atlantic coasts of Europe and northern Africa organized in 45 regional sections, each introduced by a short text setting out the orientation and size of the region, followed by a portolan-like listing of contiguous coastal localities with the distances between them. These are complemented by additional tracks across the open sea (pelagic tracks) for which both distances and directions are provided. Two distinct types of directions can be distinguished: those not affected by magnetic declination, which indicates that they were probably determined by astronomical methods, and those affected by systematic errors that could only have originated in observations made with a marine compass. 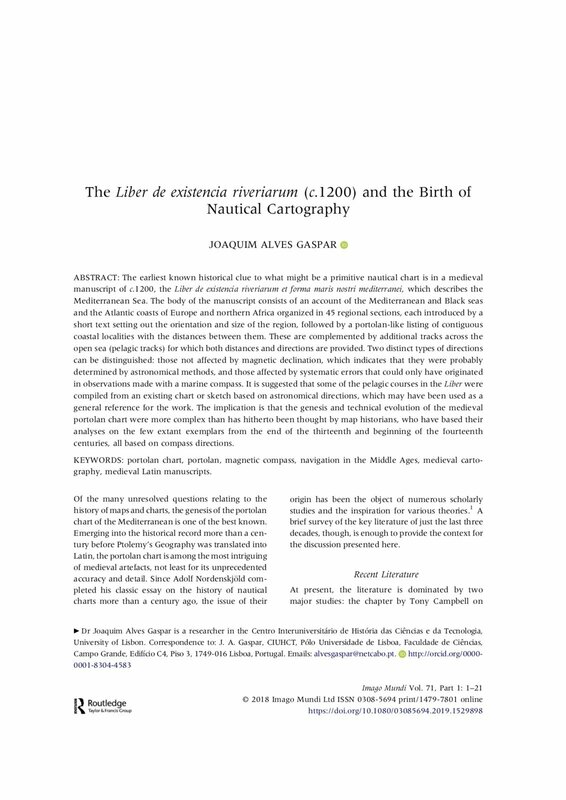 It is suggested that some of the pelagic courses in the Liber were compiled from an existing chart or sketch based on astronomical directions, which may have been used as a general reference for the work. The implication is that the genesis and technical evolution of the medieval portolan chart were more complex than has hitherto been thought by map historians, who have based their analyses on the few extant exemplars from the end of the thirteenth and beginning of the fourteenth centuries, all based on compass directions.